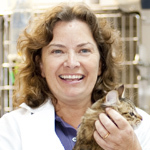 After relocating from the East Coast in the mid-1990s, Peggy interviewed at over 30 are veterinary clinics but didn’t find many that were woman-owned. Seeing other industries such as chiropractors and psychologists with women at the helm, she thought, “Why not me?” Despite qualifying for thousands of dollars in student loans during veterinary school, she found that she couldn’t qualify for a business loan. In 1995 she turned to WEV’s newly-established Loan Program, and received a working capital loan to sustain her business. She worked in emergency clinics at night and her own clinic by day to help with cash flow as the practice grew, and Artemis Animal Clinic is still in business over two decades later.